What follows is my attempt to convince and illustrate to you that this year’s Texas A&M team (which I can only assume has renamed itself “The Fighting Dalton Smiths”) is one of those things and that one player, senior Dalton Smith, is the sole reason that his team is one of those things. It is possible that this writing will be more reflective of the somewhere-between-troubled-and-charmingly-eccentric inner workings of my brain than it is reflective of any actual reality, but that is a risk that I am willing to take. It is a risk that, if you proceed, neither I nor the proprietors of this website can be held liable for you taking. These first two points contain the most turnovers of any two points by the A&M offense. Not at all coincidentally, they are also the points that Smith is on for which he allows his teammates to throw the disc the most. I can only assume that after this point Smith got his team together for a stern chat. Smith: What did we talk about? You all get ten throws to someone other than me per tournament and some of you (looks disapprovingly at Steve) just used a fifth of those throws in one point and now we’re losing. IS THIS WHAT YOU WANT STEVE? *A single tear drops downs Steve’s cheek. He swears to put his dog up for adoption so he is never again tempted to throw a disc to another living organism not named Dalton Smith. Of note: Carleton has already decided to abandon defensive traditions like “the break side” in favor of limiting Smith’s impact. Don’t worry, more abandonment of all ultimate defensive traditions are to come. There. True Texas A&M offense as God intended it. Dalton throws it to you, you throw it Dalton, Dalton throws it to Steve, Steve throws it back to Dalton with the care of someone who is returning a newborn baby into its mother’s waiting arms, Dalton throws a score and gives Steve a pat on the shoulder which Steve will remember for the rest of his life and tell his grandchildren about. Smith doesn’t take the field here. At one point this NBA season Charles Barkley said he didn’t watch full NBA games unless the Warriors, Spurs, Thunder, Clippers, or Cavaliers were playing because everyone else was too “awful.” That’s how I feel about points in games where Dalton Smith could be playing but Dalton Smith is not playing. The most notable thing about this point is that it is the first goal that A&M scores which Smith could not have possibly been involved. Smith doesn’t play again. Don’t watch this point. Here’s something more interesting you could do instead. 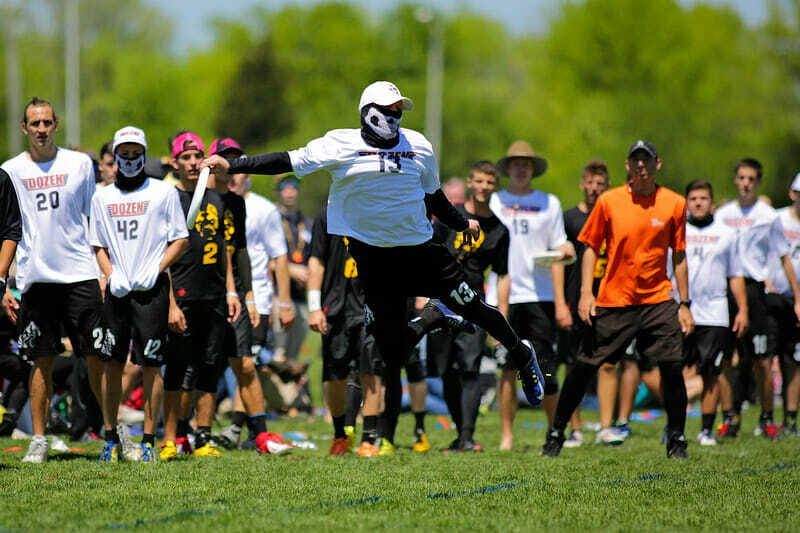 Smith proceeds to almost immediately send the disc to the end zone. I included that in the GIF because some may argue that this is Smith’s first turnover/mistake of the game. I have slowed this video and watched it enough times to tell you conclusively that Smith’s receiver touches the disc first and is unable to come down with it. Receiver turn. Smith’s only mistake here was not doinking this throw off his mark’s head so he could catch it himself. Later on, Smith lays out on the mark and forces a later throw on the huck which helps lead to the disc landing harmlessly on the turf. +.5 blocks for Smith. The previous sentence is, most likely, patently false but, if you don’t like it, write your own damn article. Carleton starts to get creative on defense leaving an open dump to deny Smith the first throw. This strategy works perfectly. Smith doesn’t throw upfield on the first throw. He resets the disc and gets the disc back. THEN he throws upfield and gets the disc back and finishes the point. Smith sits this one out but A&M gets a break. This point is notable because it’s the second A&M goal that Smith could not have possibly scored. Isn’t there some kind of rule where this receiver has to immediately sprint back to Smith and give him the disc so that HE can spike it? Smith doesn’t play. Carleton holds. In other news that just as riveting and consequential: A college team sent its roster in to USA Ultimate past the deadline this season. Carleton throws zone. Smith laughs with the mirth of a man on 20 tournament credit card roulette win streak. Smith gets creative on the first throw after a turnover to beat a poach. This later turns into the first and only point that Smith is on in which does not participate directly in the goal. I’d show you a GIF of it but the cameraman was so confused that he didn’t even catch the throw on camera. Check the video. I’m not joking. Despite a poaching player in the lane Smith bombs a nearly full field flick huck to a receiver. The cut is a little too deep and the receiver has to wait on it for a couple of steps. Never fear though, Smith understands positioning and gives his receiver a chance at taking the best position. Receiver obliges and doesn’t even have to sky for the disc. I left the next ten seconds on the GIF so you can watch the receiver get visibly upset as he contemplates a reality wherein he may have to throw the disc to someone other than Smith. Smith enters the picture just as the GIF ends, the receiver doesn’t have to continue the existential line of questioning he is currently in, resets to Smith who continues to the breakside for a goal. Smith sits for another D point and Carleton holds. Here’s something else to watch that may interest you more. Carleton gives zone another try with predictable results. Those results are that Smith throws through, over, and around the cup until the endzone is so close that to stay in zone would be suicide. At which point, Smith goes every other until he throws another score. In a way, this one is almost boring. Almost. Smith sits. A&M breaks. This is the third point that A&M scores that Smith could not have possibly been involved with. Smith still sitting. Carleton hold. Welcome to Carleton College. We are the eighth best liberal arts college in the country, according to US News. We are the birthplace of ultimate (well, we definitely have spent more money on Patagonia gear than any other ultimate entity and that’s what really counts right?). We are the school that Dave Eggers selected when he was searching for an alma mater for his witty heroine in The Circle. We laid the foundation for Thorstein Veblen to coin the term “conspicuous consumption” in his critique The Theory of the Leisure Class. We are ultimate. We are smart. We are double-teaming Dalton Smith. Smith, in case you haven’t been paying attention, starts with the disc in his hand in this GIF and then is when you must pay attention because you may not believe your eyes. Carleton genuinely double teams Smith. CUT does not poach in his direction. Carleton does not throw a Box-and-One zone. They DOUBLE TEAM him. Ready for your mind to blown a step further. This lack of regard for any sensical approach to ultimate works. Smith has so broken the rules of this game that you must break them further in order to win. This is like when Michael Jordan finally realizes in Space Jam that he’s in a cartoon world and do cartoon things. After the above hammer turnover, Smith and company are so bewildered that they do not guard or pick a force for the entire next possession. Don’t believe me? Check the tape. THEY’RE DOING IT AGAIN. It was at this point in my first watch through of this game that I realized something different was happening here. Smith has had about enough of this though. Watch that GIF enough times to notice Smith point to start things off. It’s not even inconspicuous. One would think that backhand would be enough to inspire “Fire” calls from the sideline but Carleton thinks it has found its “Secret Stuff” and sticks by the double team. You have to see this to believe it. Carleton is actually not guarding several people on the field and it is taking A&M more throws to score than usual. To A&M’s credit, Steve and company are able to stay patient and force Carleton to actually guard everyone at which point they do the only sensical thing when Smith is unable to throw the score, they throw it to him. Carleton abandons the double team strategy. A&M which has now adjusted itself to the make believe world that Carleton occupied in order to buy into its double teaming as a legitimate strategy and, confused with the reality of actual defense, turfs a throw. Smith narrowly misses on a bananas-heads-up poach D attempt but Carleton still earns the break. Smith, seeing that his team was in need of some help, does what any reasonable person would do and leads a receiver to the edge of his reach on an upline cut. The receiver is unable to control the disc on the layout. A wise man once told me, “You touch it. You catch it.” Receiver turnover. Smith’s infallibility continues. Let the record reflect that the author believes that Smith was inches away from stuffing the huck. You can critique his earlier throw if you want (you’d be wrong) but you can’t critique Smith’s nose for being in the right place at the right time doing the right thing. A circle is the perfect shape. Dalton Smith invented the circle when he literally ran in one around Carleton’s defense on this point at Florida Warm Up in 2016. He subsequently invented the semicircle when he threw a flick blade that followed the path of a semicircle for a score over and around Carleton’s defense. A&M works the disc all the way down the field before Smith gets nearly trapped on the goal line. It even appears for a moment that Smith has either been stalled or thrown a high count turnover. There is a long dispute over the foul call. In this case, though it’s difficult to tell what the call is about, I must side with A&M. Why? Well, if the call doesn’t go in A&M’s favor then Smith threw a turnover and Smith’s unfamiliarity with turnovers is akin to Bo Jackson’s familiarity with… well… everything. With the stall coming back in on 8, Smith throws a trust scoober to a receiver on the force side of the field because why wouldn’t he? Legitimate question, is it a “trust throw” if the only trust I had was that it was never going to be incomplete? No Smith. Carleton hold. No witty comment. Too bored. Imitation is the sincerest form of flattery but I’m sure Smith would go without the compliment if it meant that #12 didn’t turn the disc over trying to bomb a flick blade over the Carleton defense. You’re from Texas. Doesn’t the phrase, “There’s only enough room for one sheriff in this town,” mean anything to you? Maybe in All The Pretty Horses Cormac McCarthy was writing about fate in a universal sense. Or maybe he was writing about the last point of this game, which, doubtlessly, was predetermined in time far earlier than our comprehending. Smith accounts for 11 of Texas A&M’s 15 goals. Three of the four unaccounted-for goals were scored when he was not on the field. The one unaccounted goal for which he was on the field was such an abomination that the camera couldn’t even find it. It exists only now as does Bigfoot or the Loch Ness monster, half a figment of our imagination and, perhaps, half a reality. So, if you’re in Raleigh this weekend, don’t waste your time with petty mortals. Saunter over to A&M’s fields and watch Dalton Smith break reality. If you aren’t in Raleigh, pray Smith and company make it into a taped bracket play game. Wherever you are, if Smith and company don’t perform well at the tournament and you see a lonely college age boy on the side of the road muttering about “throwing discs to Dalton,” do us all a favor and give Steve a ride back towards College Station. He’ll be alright eventually. Comments on "The Only Team Worth Watching At Nationals Is Texas A&M (Or: An Ode To Dalton Smith)"